That's sort of the catchphrase of the movie "The Hudsucker Proxy," the subject of today's deviation. It's a 1994 film from the Cohen brothers, and starts Tim Robbins, Paul Newman and Jennifer Jason Leigh, and it's, well, like a lot of the Cohen brothers movies, it's a film out of its time. The Cohen brothers have done a lot of films that people know really well - Fargo, No Country For Old Men, Burn After Reading, O Brother Where Art Thou? and, my personal favorite, The Big Lebowski, but they also made a bunch of films that just didn't get the same level of attention, the best of which, in my personal opinion is The Hudsucker Proxy. Part of the joy of the Cohen brothers is that they make movies from another era. Burn After Reading, for example, is a screwball comedy but done in the sort of Reagan-era Commie paranoia fearmongering in the eighties. The Big Lebowski is set in the early 90's, but is meant to evoke the sort of meandering plots of Raymond Chandler. It was, for lack of a better term, stoner noir. 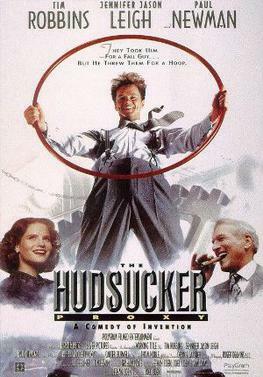 The Hudsucker Proxy is also a screwball comedy, but one that seems to be somewhere between a Frank Capra film and a Mel Blanc Looney Tunes cartoon. It is definitely about big business, the little guy, rags-to-riches and the bizarre success of simple. It's about the hula hoop. Sort of. It feels like the kind of film you would've seen made in the 1940s, but with a very post-modern take. Tim Robbins is Norville Barnes (what a name, right? ), a small-town guy with big ideas in the very big city, and he gets a job as a mail clerk, and before you know it, he's running the company, although not the way he intended and not for the reasons he thinks he is. See, Paul Newman is attempting to use Tim Robbins to run the company into the ground, so he can buy up the stock cheap and then rebuild it. But Tim Robbins has an idea, and since he's in charge of the company, he's gonna make it. The weird charm of the picture is hard to encapsulate into a handful of words, but it's certainly not a film for everyone. A lot of critics at the time didn't care for it. They thought it was all style and no substance, or that the film lacked humanity, but to my eye, I think a lot of the critics missed the point. The style IS the substance, and the film has humanity in spades, but it's a simpler, less modern view of humanity. It's almost a fable in its elegant simplicity, and it's a pitch-perfect echo of the films it is shadowing. Those critics forget that a Frank Capra film seen through a modern lens looks, well, a little to "aw shucks" to be genuine, because those were simpler times. That's what this movie is trying to evoke. Gotta hand it to the Cohens - they like to be different.